ATN NVWSMRS240 MARS2x-4 Night Vision Weapon Scope FREE SHIPPING! The ATN MARS 2x-4 Night Vision Weapon Scope is part of the company's flagship range, named after the Roman god of war. It's designed to outperform current military standards, featuring precision-engineered, multi-coated heavy glass lenses that maximize clarity, light transmission and image fidelity. Each scope is individually calibrated to ensure accuracy for standard Picatinny or 7/8-inch Weaver rail-equipped firearms. The reticle can be toggled between red-on-green and amber-on-green modes to suit different tactical environments, while precision windage and elevation controls make it easy to zero-in on a target at any distance. The tube is nitrogen-purged to prevent fog and can withstand immersion in up to 66-feet of water for up to an hour, making it suitable for even the most extreme weather conditions. The fourth-generation, night vision intensifier is equally powerful and comes with a digital remote control for quick manual adjustments. It also features automatic brightness adjustment technology, as well as a bright light cut-off to rapidly adapt to changing lighting conditions while maintaining a consistent image and protecting the tube from damage. When ambient light levels reach zero, the detachable IR450 infrared illuminator takes over to maintain visibility. The scope includes a mil-spec hard case for additional protection when not in use and convenient carry when on the go. 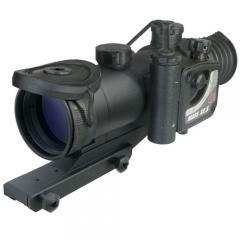 ©2002-2019 CopsPlus.com: ATN NVWSMRS240 MARS2x-4 Night Vision Weapon Scope FREE SHIPPING!